From the architect. The latest addition to the Brisbane dining scene is Pony, a restaurant created around indulging the senses and the theatrical staging of food preparation for the charcoal grill. 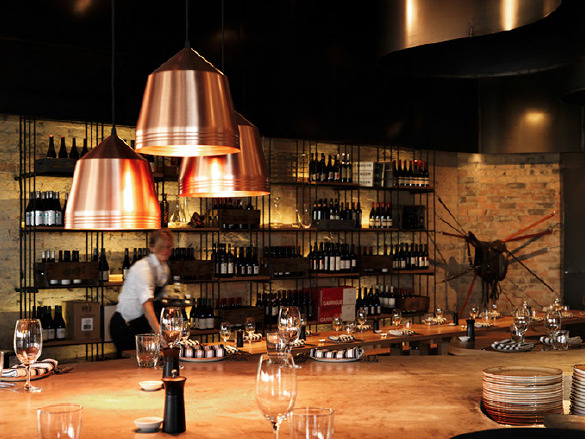 The restaurant is owned by the Kyprianou family and is the third Pony, the first outside Sydney. 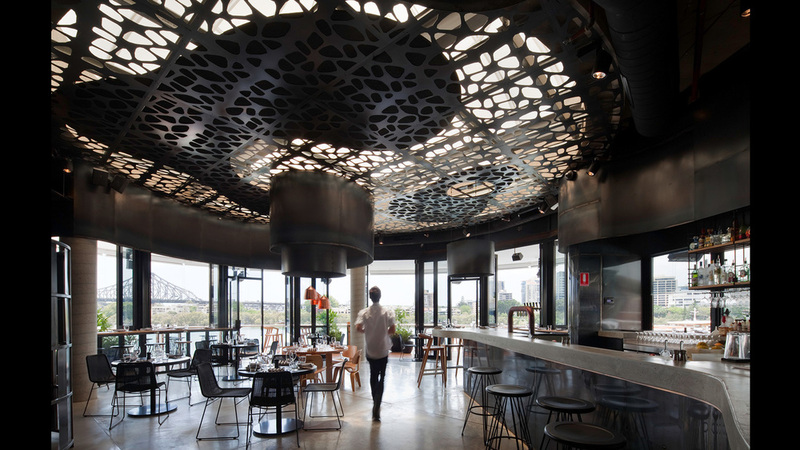 The site is a riverside location at Brisbane’s Eagle Street Pier and provided the opportunity for indoor/outdoor dining with river views. 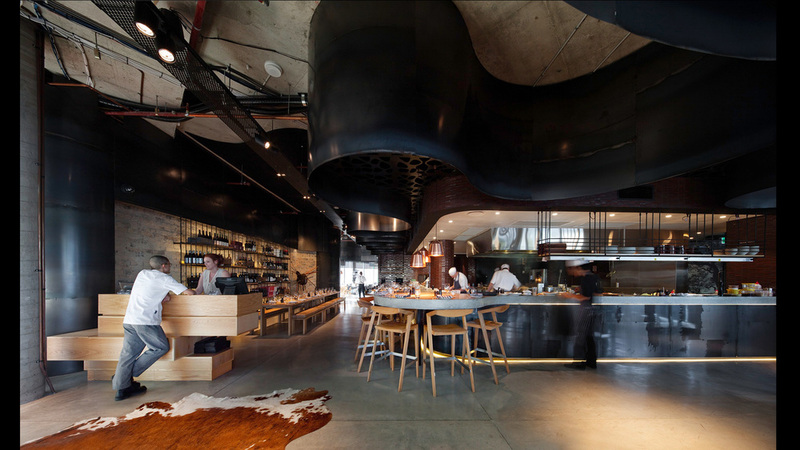 At Pony, it is a combination of interior, food and service which a sensory and emotional experience is evoked. Food provides a major inspiration for the design, while the spirited chefs on display, and the maître-d’s and wait staff, provide a vital force that animates a dramatic scene. 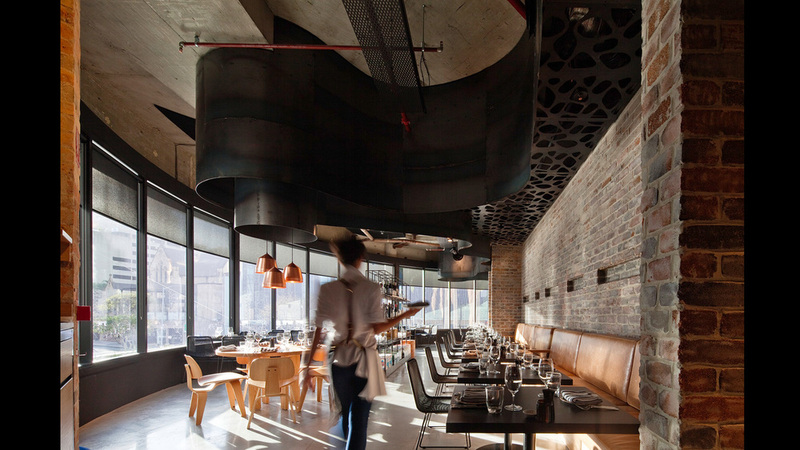 The restaurant features a number of dining spaces, with indoor transitioning to outdoor via an open, timber decked interior space connected to a bar. The result is a series of dining options, from open, communal spaces, to more intimate banquettes, and the full dining experience at the kitchen. A lasting impression starts as diners are granted direct access to the action of the open kitchen, bringing focus to the sight and smell of an open rotisserie. Great hospitality design creates meaningful experiences for the visitor by engaging the senses on a number of levels while addressing functional and aesthetic concerns. The overall intent was to construct a sense of instant history in the space, evoking a sensory, emotional experience. From an operations perspective, serious consideration is always given to achieving outcomes that provide maximum operational flexibility, efficiency and innovation. This philosophy flows through the whole project from the operational flexibility of the space allocation of the dining space to the highly innovative state-of-the-art kitchens that have been specifically designed for very high quality maximum foodservice capacity. The final appearance of the project is as vital as the original idea and all stages of its evolution; the restaurant was a process of discovery with the materiality. Imperfections were incorporated into the design and celebrated. Drawing from the art of the ‘farrier’ or blacksmithing, a two-metre steel ribbon winds through the space, implying metal that can forged and shaped like a horse shoe, capturing the poetics of production as a key part of the interior language. There was little wastage in materials as full sheet metal sizes were used, plus exposed services, non-toxic materials and low level lighting also contributed to the sustainability of the design.